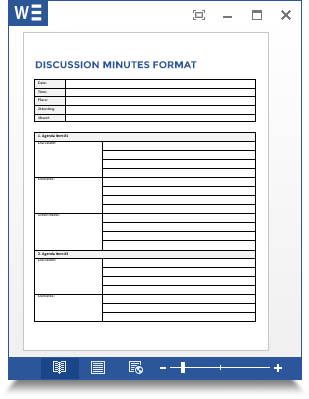 This web site is designed to provide information about meeting minutes and improve the way you take notes and create minutes. Minutes, protocols or notes are a written transcript of what took place or was discussed during a meeting or hearing. Often, notes are taken during the meeting by a designated note taker or secretary who proofreads and prepares the final meeting minutes after the meeting. Here you can find some tips and tricks to take more efficient meeting minutes. 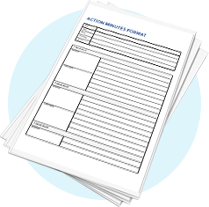 Proper meeting minutes and electronic archiving will ensure you get more out of your meetings. 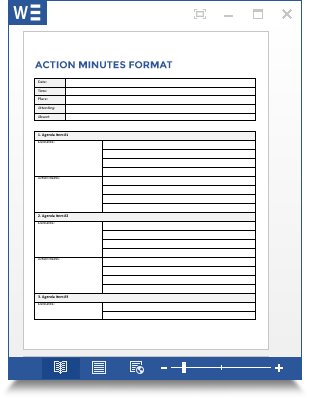 Read more about Minutes Formats. Most meetings are executed in a democratic setting where attendees share decision-making and accountability. Therefore, minutes should be approved, which typically happens in the beginning of the following meeting. Sometimes the chair, secretary or note taker can amend the records from the meeting to clarify and elaborate. However, this could be risky as perceptions of a conversation often vary by stakeholders. It is better during the meeting to have the note taker or chair summarize the discussions and note the consensus of the main points. The note taker could choose to show the records as they are being taken live on a projector or screen unless the meeting is a public hearing, board meeting, congress meeting etc., where it would not be appropriate. If you are the note taker, using a Word document with a proper minutes format or using a minutes software program helps when displaying the capturing of notes live. If you are editing the minutes, it should be done shortly after the meeting, while attendees can recall what took place. It is beneficial to distribute the minutes to the attendees shortly after the meeting to ensure that actions are carried out in due time.